The Hobbit, The Lord of the Rings, and Tolkien - The One Ring • View topic - Tengwar Original English Mode, Enhanced! Tengwar Original English Mode, Enhanced! I noticed I'm not fond of Lambë, esp. when it appears in a string of consonants. It looks clunky to me then. One thing I like about Tengwar (in a NON-full mode) is that the profusion of tehtar and tengwar that stand for two English letters together make any typical English utterance shorter and more compact in Tengwar. And I like the elegance of the 8 "extra" tengwar whose telcor are "extended", and bemoan the fact that they don't get more use. One does duty as the abbreviation for "the", and another for "of". The tengwa for "p" with its telco extended becomes the "Greek ph" and the one for "c", likewise extended, becomes the "Greek ch". But 4 of them remain unmapped. I wanted a way to use the unused ones for some of the pairs of consonants ending with "L": "bl", "cl", "fl", "gl", "pl", "sl". Wanting to map them sensibly, I considered how best to do it. "PL" could use the tengwa for "ph" but with the lúva unclosed. Likewise "CL" could use the tengwa for "ch" but with the lúva unclosed. "GL" could simply be the tengwa for "G" with the telco extended! Finally I assigned "SL" to the tengwa with two unclosed lúvar. (As it happens, on the "tengwar keyboard", that tengwa is typed with "S")! I was disappointed I didn't have 2 more available to use for "FL" and "BL". Then I had an epiphany: (assuming you write words in tengwar separated by a space for clarity) the tengwar used for "the" and "of" are always used alone since they represent whole English words. Each will be surrounded by spaces when used as "the" or "of"! So they are free to be used for "FL" and "BL" which will NEVER be used as a whole word! So I assigned "BL" to the tengwa for "B" but with its telco extended. That left "FL" with only one place to go: on the tengwa used as the abbreviation for "the". I no longer have to use Lambë in any of these cases and any such pair of consonants consumes that much less space and is that much more compact. 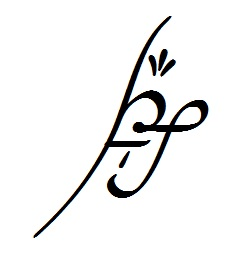 I discovered some words become truly short spelled this way in Tengwar. Consider "apples": one tengwar (one lúva unclosed on the right, extended telco), tehta for "a" above the lúva, tehta for doubled consonant below the lúva and a "silent-e" tehta under that, and completed with an s-curl! The double-consonant mark cannot be misinterpreted: the letter preceding the "L" will always be the one doubled, not the "L" itself.